Sounds great, MJ! And sweet that your hubby worries about you. Mine does, too, all while pushing me to do new things! LOVE that horse and buggy, but you probably knew I would! What a wonderful gift to yourself to get away. Glad you were 200% safe at your destination and 100% safe getting there. HS friend and I are taking a road trip next weekend to meet up with another hs friend in TX. Yes, it’s Memorial Day weekend but having been with family this weekend and going to be with them again the weekend after Memorial Day…can’t wait for a girls trip. I am glad I didn’t cave and make it easy on everyone else (that I not go). 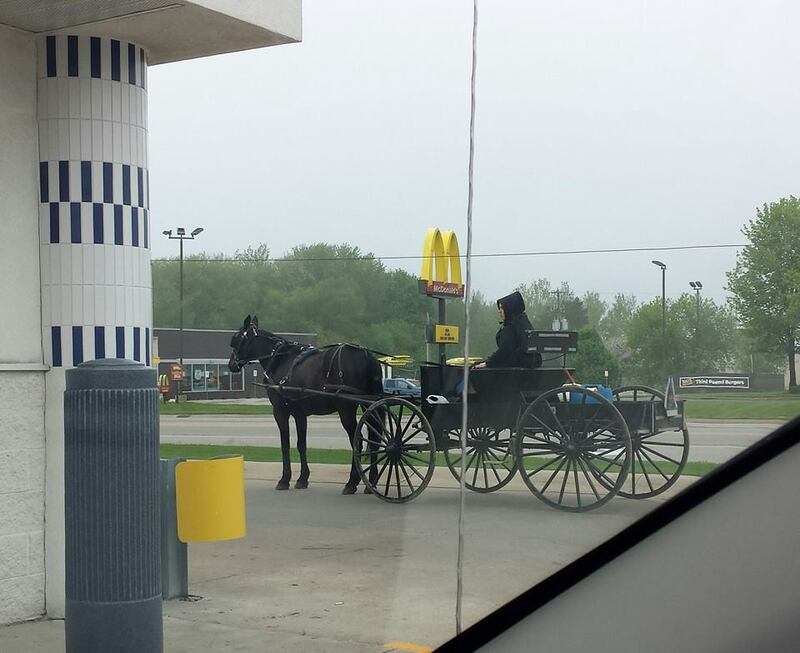 I had a big belly laugh when the Yoders pulled up (Amish buggy) — I knew I had to capture a photo of my “danger” for poor nervous Hubby. Good for you for engaging in the workshop! Sounds like it was an amazing event for you. My hubby is the same way. He was out of town this weekend, and Saturday I explored some new trails at our local state park. It’s their way of showing they care ~ for my Hubbs lots of huffing and questions = OMG will you be ok and come back? I know, and I knew you’d get it. When I was much younger (and stupider) I was put off by it – I understand it now!! M. Scott Peck was one of the first authors I was introduced to who taught me how to shift my perspective on life. He was an important teacher to me. I’m so glad your workshop was so powerful for the attendees. One of the last things I did for me was to go to a 4 day workshop (in late Feb). It was all about connecting our heads to our hearts and about listening to our heart for guidance. The amount of amazing unconditional love that everyone held for everyone else was off the charts. It was beyond special. Your comments made me smile so much, Dor 🙂 Glad you are enjoying the conversations & camaraderie – I agree, that’s where it’s at.